Does anyone know where these photographs were taken, and as to what they depict? These images were taken, early in the year 1967, and they capture the coming of great change to our way of life in Sheffield and South Yorkshire. They were actually taken beyond the Sheffield Boundary, but only just beyond, and they are of a scene that most of you will be familiar with even to this day. This location was to go onto witness a further significant development, but that was to come later, in the mid-1970's. I suspect that 2018 will represent the fiftieth anniversary of the coming this change, and it was one that has probably impacted in some measure, on the lives of each and every one of us. Some might argue that 2017 is the fiftieth anniversary. Either way, as to whether that change has been for good, or for ill? I think that even now, fifty years on, you could still, with the benefit of hindsight, build a comprehensive case in support of either stance. Certainly, at the time, it was to divide communities, in every sense; blight the lives of some; and to bring MASSIVE benefit to others. I certainly recall the pros and cons being debated in class at school, with both its' supporters and its critics expressing strong, well-supported views. Not taken by me, but by the late Phil Downsby, who first introduced me to photography, and who had the foresight to record on film, much, which at the time was thought to be mundane. Was it the opening of that section of the M.1 motorway? 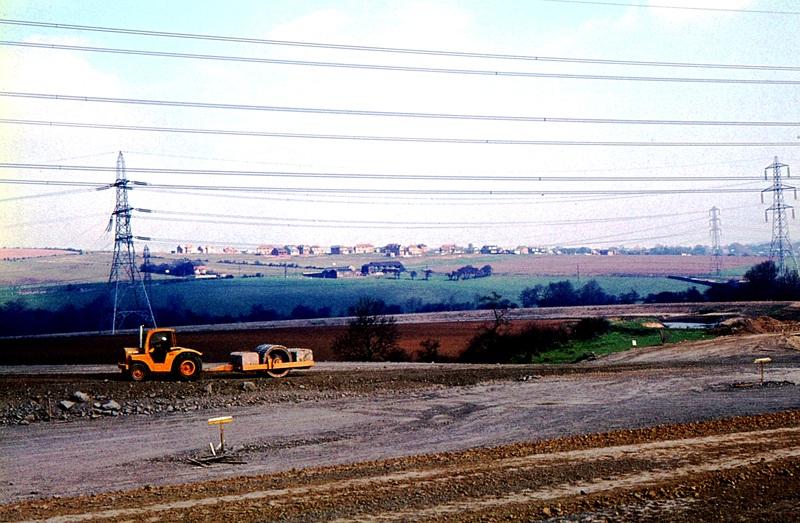 The images depict the construction of the M1 Motorway, or specifically, the construction of junction 33, which is the A630 junction to Rovrum. The tractor and its roller are progressing up the southbound, entry slip road, a manoeuvre that would not be recommended today, as it would be against the flow of traffic. Both images were taken from the top of the north bound, exit slip road, a practise which also, would not be recommended today. 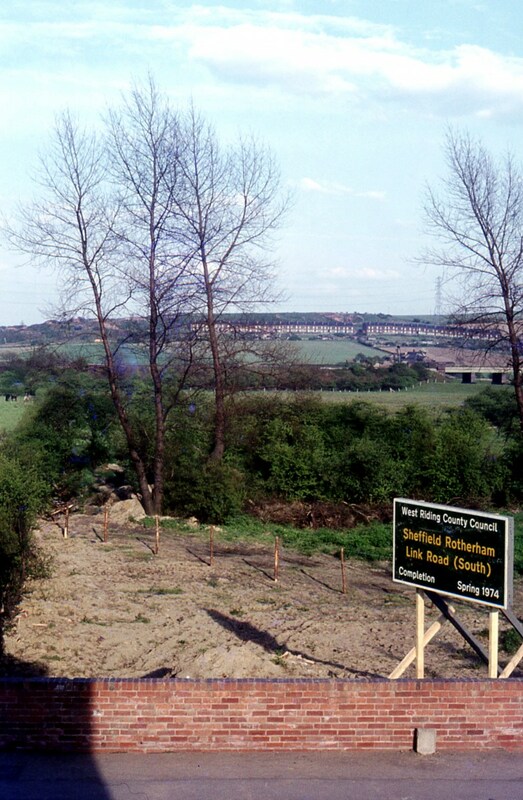 The big development that was to come, was the connection of this junction with Sheffield City Centre, and that was to come with the Sheffield - Rotherham Link Road, opened in the spring of 1974. Today, we call that link road the Sheffield Parkway. Great, what do Peter and I win? An hour in an M.1 traffic jam? (Second prize: 2 hours in an M.1 traffic jam). Well - I was hoping that the pair of you might want to nip down there sometime and perhaps create a 'then and now scene'. 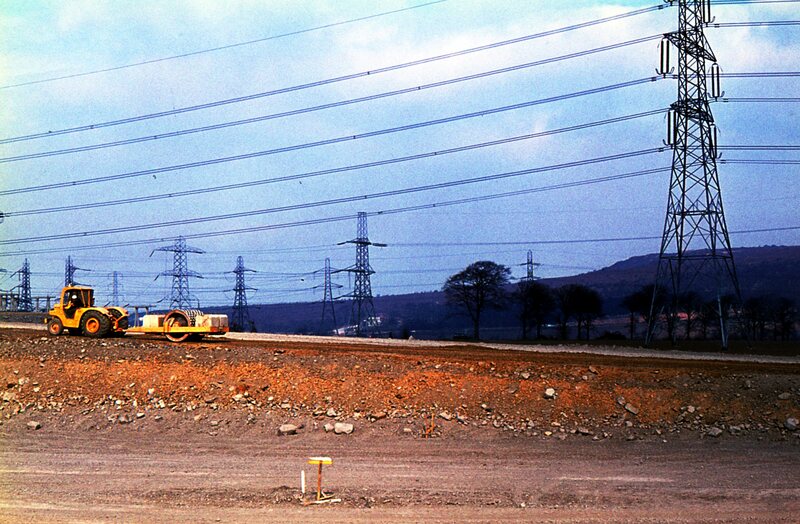 When I first saw the electricity pylons I briefly thought it might be laying the runway for Sheffield International Airport. Then I realised the date was too early. Fifty years on .... we still don't have one. "Sheffield City Airport" to be precise and it never intended to be anything other than a "feeder" airport serving domestic and near Continental destinations.. It was built to exactly the same design as the now very successful London City Airport. Its closure is another story and we still haven't got an international airport within minutes of the Town Hall....although Robin Hood Airport Doncaster Sheffield , truthfully is not far away...just needs more services.